During the African Humid Period (AHP), starting ca. 12800–10000 BC, hunter-gatherer groups repopulated the Sahara, marked landscapes with rock art, and occasionally created cemeteries. The Typical Capsian culture (ca. 7500–6000 BC) is characterised by large tools, mainly burins, scrapers made on blades, with blade production involving knapping schemes derived from simple or complex core preparation. These indicate the use of soft and hard hammer percussion for blades and flakes, which are then retouched to produce a variety of tools. Sites show accumulation of land snail shells, ash, burnt rocks, knapped flint, worked (human and not human) bones, and mammalian faunal remains. Capsian sites are concentrated on the high plateaus of eastern Algeria and southern Tunisia, although the culture shows variants to the west and east into Lybia (Rahmani and Lubell 2012). Cord-wrapped roulettes are among the earliest cord-based decorative tools in Africa, appearing at Aïr Massif in Niger, later in the Sahara region between Algeria and Libya ca. 8th–6th millennium, as well as on the Atlantic coastline and Mauritania’s interior dating from the 6th–5th millennium BC. Vessels with flat bases are also found along the western coast up to pre-Saharan Morocco. These features appear in Morocco’s Middle Neolithic pottery, which suggests contacts between the populations of the interior potentially related to the end of the AHP. Before the expansion of Neolithic farmers, clear links can be seen between both shores of the Mediterranean in Mesolithic hunter-gatherer blade and trapeze industries from the North African Upper Capsian, the Castelnovian in Italy and southern France, and the Geometric Mesolithic in the Iberian Peninsula. This north–south network of connections is also seen later during the Mediterranean expansion of the Neolithic (Guilaine 2017). Proto-Afroasiatic is proposed to have emerged in the southern fringe of the Sahara in an “upside-down” view (Bender 2007), which would put the Afroasiatic homeland near Megalake Chad during the African Humid Period (ca. 9000–3000 BC). This period was probably marked by a Sahelo-Sudanian palaeoenvironment of isolated wetlands and small lakes, with a pale-green and discontinuously wet Sahara forming north–south and east–south pathways (and a continuous east–west corridor in the southern half of the current desert) that allowed for human migrations (Quade et al. 2018). This corridor would have allowed for a sizeable population expansion in south-central Saharan territory, for an eastward expansion of Cushitic and Omotic, and for a migration of Hamito-Semitic speakers (including possibly Berbero-Semitic) to the north-east. This model agrees with Chadic languages being the most divergent of the Afroasiatic group, excluding Omotic, whose population has been shown to be mainly of sub-Saharan ancestry, in contrast to other Afroasiatic peoples (Baker, Rotimi, and Shriner 2017). 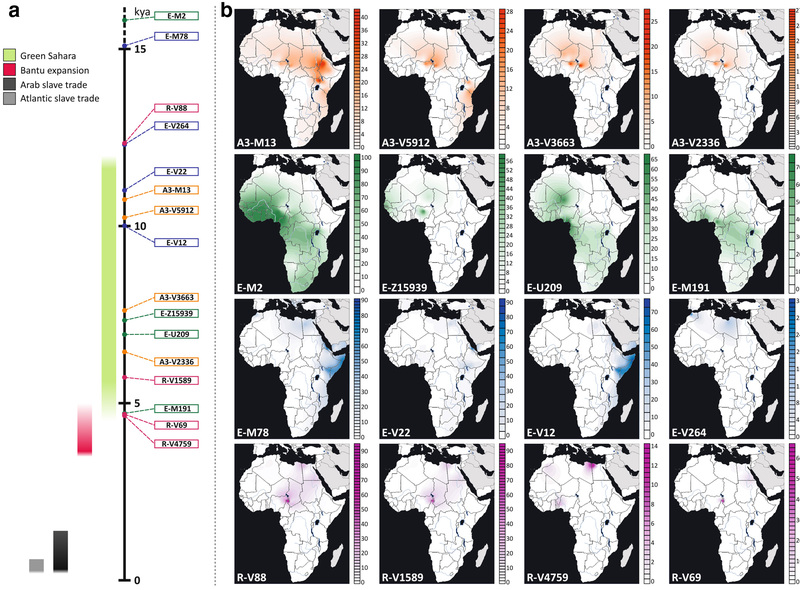 · R1b1b2a2-Y8447, the main African subclade (formed ca. 5500, TMRCA ca. 5000 BC). · R1b1b2a2a-V1589/Y7771 (formed ca. 5000 BC, TMRCA ca. 3100 BC) and most other rare African R1b1b-V88 lineages (not considered below) are distributed widely, in descending proportion, in central Sahel (around the prehistoric Megalake Chad), in eastern Libia and north-west Egypt, in south Egypt and north Sudan, and in central Sudan and east Sahara. o R1b1b2a2aX-V1589 (TMRCA ca. 3700 BC), with a distribution similar to the parent haplogroup R1b1b2a2a-V1589/Y7771. o R1b1b2a2aX-V4759 (TMRCA ca. 2700 BC) peaking in eastern Libia and north-west Egypt, and spread also through the Maghreb and south-western Africa. o R1b1b2a2a1-V69 (formed ca. 3000 BC, TMRCA ca. 2600 BC), peaking around lake Chad, and also found in south Egypt, Sudan, and eastern Africa and Arabia. R1b1b-V88 lineages related to the Villabruna cluster probably crossed the Mediterranean into northern Africa, most likely through the southern Italian Peninsula, eventually expanding with the Capsian tradition. This is supported by rare subclades found in southern Europe, like R1a1a1a2-M18 (split ca. 10300 BC), present mainly in Corsica and Sardinia; R1b1b2a-Y8451/V2197 (formed ca. 7500 BC, TMRCA ca. 5500 BC) and R1b1b2a1-V35 (split ca. 6700 BC), present mainly in Sardinia (Cruciani et al. 2010). The presence of the rare mtDNA haplogroup J/T in Epipalaeolithic samples from Afalou, as well as in modern populations of northern Morocco (1.8%), Sicily (1.8%), and other Italian populations (1.6%) also point to ancient contacts of west Africa with Italy (Kefi et al. 2018). A migration of these lineages through Iberia seems unlikely, because there is large genetic continuity of an endemic element related to ANA (found in Epipalaeolithic Iberomaurusians and in Early Neolithic samples) in north-west Africa until the Late Neolithic (Fregel et al. 2017), where only later does ancestry from Iberia appear associated with the expansion of European Neolithic, probably through the Strait of Gibraltar (Fregel et al. 2018). The presence of sub-Saharan admixture in Middle Neolithic and Chalcolithic samples, as well as the finding of mtDNA hg. L2a1 in a Bronze Age sample from south Iberia point to a north–south genetic structure in pre-Neolithic Iberia, with hunter-gatherers probably showing resemblance with sub-Saharan Africans (González-Fortes et al. 2019). There is a cline of ANA:Natufian ancestry in North Africa from east to west (Rodríguez-Varela et al. 2017), but a hint of Villabruna ancestry can also be inferred in all modern north African populations west of Libya, which is consistent with gene flow from Iberia during the Late Neolithic (Lazaridis et al. 2018), but could also be at least partially related to the expansion of R1b1b-V88 lineages through southern Italy in the 7th–6th millennium BC. R1b1b-V88 is found at high frequencies among the Toubou population (34%) inhabiting Chad (Haber, Mezzavilla, Bergström, et al. 2016), who also show 20%–30% ancestry coming from outside of Africa, related to Eurasian herders (Schlebusch et al. 2017), potentially linked to this ancient migration, since a good proxy for this ancestry (apart from ancient Levantines) are present-day Sardinians (Pickrell et al. 2014). From north-central Africa and through the green Sahara, with gradual desiccation of the desert until ca. 4000–3000 BC (Drake et al. 2011), Afroasiatic speakers of R1b1b-V88 lineages could have expanded in all directions following for example the researched Fezzan–Chad–Chotts, and Chad–Chotts–Ahnet–Moyer pale green areas. 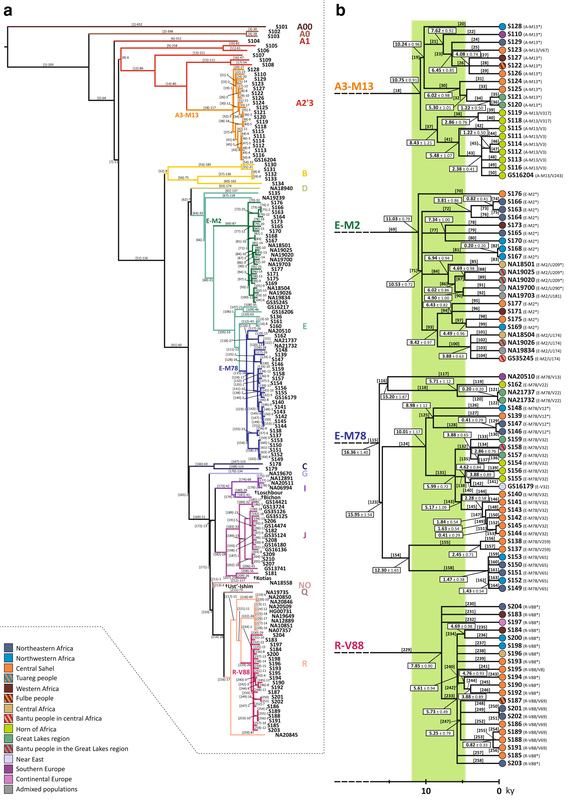 The role of certain E1b1b1a1-M78 lineages (split ca. 13200 BC)—widespread in eastern Africa—in secondary expansions of Afroasiatic languages seems very likely: E1b1b1a1b2-CTS9547/L677 (formed ca. 8000 BC, TMRCA ca. 2400 BC) in east and north-east Africa; E1b1b1a1a1-V12/Z1216 (formed ca. 9900 BC, TMRCA ca. 8000 BC) in the east, peaking in the Horn of Africa; and E1b1b1a1a2a1-CTS194 (formed ca. 2600 BC, TMRCA ca. 200 BC) in Libya and the Maghreb (D’Atanasio et al. 2018).